Add a soothing lamp light to your childs bedside table with this cute dog-shaped lamp, great as a nightlight or as a desk lamp. A cute and unique looking bedside lamp with an adjustable neck, this smooth and colourful lamp is ideal as a night light for the bedroom. Waldo is a low voltage (12V) lamp light and therefore will always be ‘cool’ to touch making him ideal to use as a night light. He has no electrical parts that can be accessed by little fingers and he will watch over you from his perch on the bedside table during the night and can also be used as a desk light. 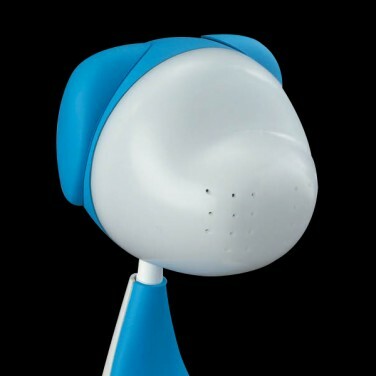 Colourful and cute lamp designed in the shape of a dog. A halogen lamp with no accessable electric parts. Ideal as a night light. Mains powered lamp with an inline switch.